This is the second Liberty 9929 I’ve made — this is Liberty Mim, one of my favorite prints. This print just makes me SO HAPPY, although I’m not sure if I look happy in this photo … probably the fault of my contact lenses. They’re so much more convenient than glasses when I know I’ll be in and out of the pool and the ocean all day, but hopping in and out of the pool and the ocean means lots of chlorine and salt in my eyes, too, which is not so convenient. Anyway. The yellow sandals are from Topshop, from my trip to the UK in May 2011 (they have bows across the top which I don’t think you can see); same old Swatch, and the orange bracelet is one of those RoadID thingums that has your name and your ICE phone number and what your blood type is. I wear it running and also when there’s any chance at all of a lifeguard having to pull my unconscious body out of the surf. It’s been a great trip but I’m looking forward to being home tomorrow … and not just because that’s where my sewing machine is! You look so happy and beautiful. Could be the Liberty print, maybe the 9929, perhaps being in Florida on vacation. Is this a vacation rental? Do they have secret access to “furnishings unlike any you would ever actually own?” Just wondering. 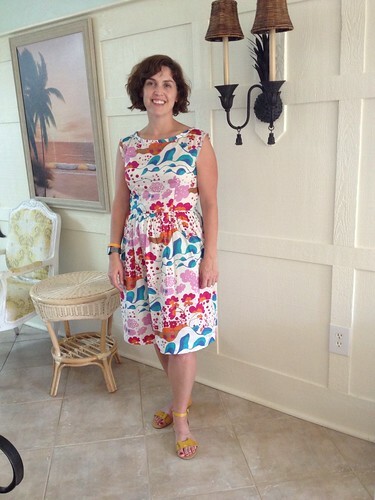 The colors are great on you and fabric is perfect for this dress pattern. Great choice. Safe travels. This is the best one that you have made. I love this fabric and it looks great on you. Great looking dress on you and the fabric is so happy looking, you are right about that. It does look like a happy vacation dress. Love the dress – looks good on you, and such a cheerful thing. But I have a serious warning – don’t wear your contact lenses in the pool or the sea! There has been publicity recently about blindness caused by this – do Google it. Lovely! Love the print, it’s just so happy! I can see why this print makes you so happy! The colors are fantastic, and the design is so whimsical! Very cute dress. Love you in this dress with sandals, print reminds me of Little Mermaid – I guess because of the colors. Can’t tell you how impressed I am that you wear a BIKINI, would have to be medicated in order to be in right mood to even try one on! I really like your dress, the print is so pretty! I would rather take too many bathing suits also so I don’t have to get back into a wet suit, gah! I resisted that print at the time but seeing how lovely it looks here, I very much regret it now! Such a perfect dress for the summer. Did you line it? Erin – I know you sew with Liberty alot… I have a question about sewing with Tana lawn, do you interline it or just line the garment. I have never sewn with it and want to showcase this wonderful fabric as best I can. It is Tana Lawn Peacock Light Blue/Turquoise and I love it! I’m pretty lazy — I don’t line the Tana Lawn (I also own a lot of slips). I did underline a black eyelet 9929 that was a similar weight … I’ll try to get pictures of that up soon! thanks – I’d like to see that eyelet dress!